Is anyone else noticing the reset/program buttons on the back becoming less responsive? I find that I have press quite hard to get the pokitto into CPR DISABLD mode. Is this the same issue that resulted in different buttons on the front? It’s not too much of an issue, just something I have noticed. The flash button on mine hasn’t been working for a while. The reset button wasn’t working, turned out it was just misaligned with the board. Simply opening and closing the Pokitto fixed it. I’ve had issues with mine, a good disassemble and clean fixed it. Probably a misalignment as @fmanga said, but the clean didn’t hurt. I also find they can be a bit misaligned at times. most likely because the black conductive thing isn’t making proper contact or something. I’ve noticed some issue with the reset not working properly as well I figured it was a dust issue. Sorry to hear about this. I wonder how I never picked this problem up. To get the Pokitto in flash mode I usually have to press pretty hard to make sure the button is all the way down. Made it confusing the first few times trying to figure out the way to do that haha… thought it was just me. I would imagine in future revisions, simple adjust the gap between the pads so they’d be less likely to miss? I did a quick dangerous experiment. 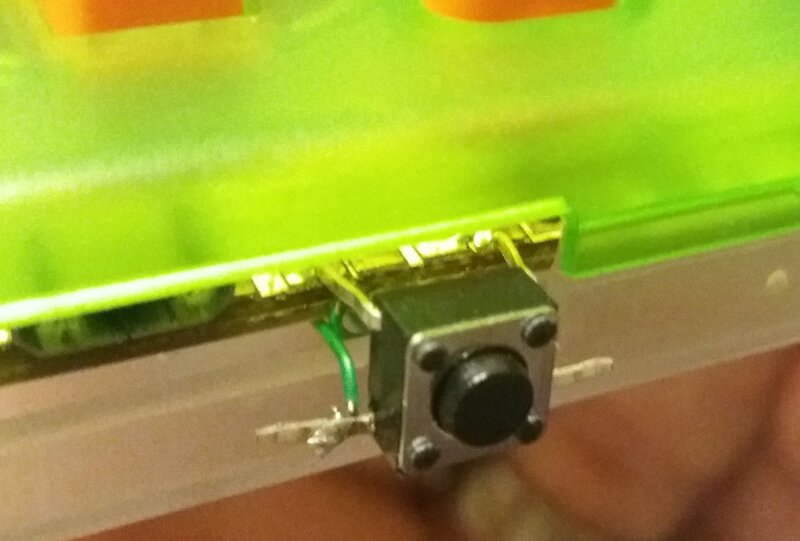 I added a ‘real’ button, connected to the pads on the program button and used the extra pads on the bottom of the pokitto (latest revision) to secure it to the device (rather stupidly without first checking if the pads did anything). Fortunately I didn’t fry anything and can now easily put pokitto in program mode. :-)I would have taken a photo of the back of the pokitto, but didn’t for reasons known to some people, but you can guess what it looks like, I have 2 wires from the switch to the flash button.